To view the TDN’s Advertising Price list – Click Here. 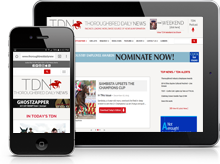 For the TDN Weekend Media Kit, Click Here. 3. All advertisements are published in print, online, and on social media upon the understanding that the advertiser and the advertising agency (if any) assume full and complete responsibility and liability for the content of all advertisements submitted for publication. Advertiser and the advertising agency warrant that all advertisements comply with all applicable federal and state laws and regulations. The advertiser and the advertising agency each represent and warrant that the advertisements will not contain any matter that is false, deceptive, misleading, obscene, disparaging or libelous, or that violates any person’s right of privacy or publicity, or infringes on any copyright, trademark or confidentiality right. TDN is not responsible for errors in typesetting or otherwise done by TDN. The advertiser and the advertising agency each agree to indemnify and hold harmless TDN and its employees and representatives from any and all loss, expense, or other liability, including attorney’s fees, arising from any claims based on a breach or alleged breach of the foregoing representations and warranties.